I recently told the mister that I needed tomatoes to can for the winter. He accepted the challenge and brought home 125 pounds of tomatoes! That was a “little” more than I expected, Being the “I will not be defeated” type, I accepted his challenge. 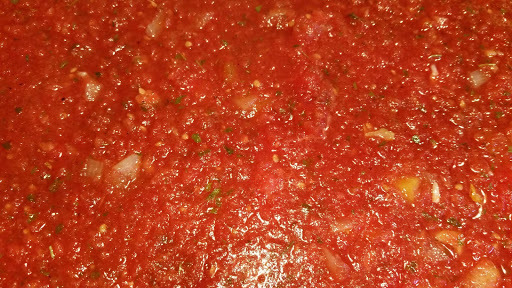 After canning 40 pints of tomatoes and 11 pints of salsa, I ventured into a realm I had not entered before….spaghetti sauce! We eat spaghetti often. It is my “go to” meal when I am tired or in a hurry to get dinner on the table. While some people cook their sauce for hours, I’ve never been one of those people (although I LOVE a slow simmered sauce). 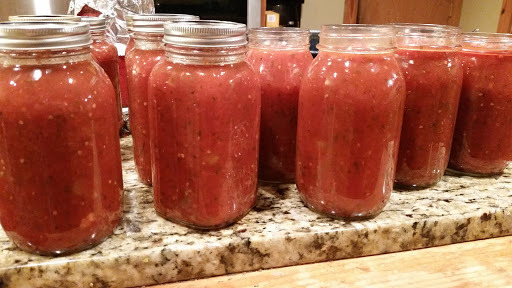 When I decided to try canning spaghetti sauce, I scoured the internet and Pinterest for ideas. One recipe that really caught my attention was a recipe that called for allspice as an ingredient. Seriously? That is one spice I would NOT have considered, but after trying it I admit it’s a wonderful addition. Just to give you an idea of what 125 pounds of tomatoes will do to your kitchen…. Sorry…back to the spaghetti sauce. Peel the tomatoes and put them thru a food processor using the blade attachment. Combine the tomatoes, onions, celery, garlic, parsley, and olive oil in a large stock pot. Bring the mixture to a boil and simmer for 30 minutes. Add the spices and simmer for 2 hours. Stir every 5-10 minutes to prevent the sauce from sticking. Pour the sauce into quart jars, wipe the rims, and process in a water bath canner for 40 minutes. This recipe yielded 10 quarts. I had the mister try the sauce before it was processed. I *might* have had another quart, but he kept going in for another “taste”. It’s THAT good!